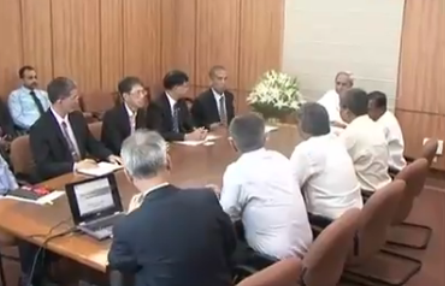 ONI Bureau: Odisha Chief Minister Naveen Patnaik today met Taiwan’s state-owned firm CPC Corporation delegation led by its president Shun-Chin Lee at the state secretariat in Bhubanesar. Odisha Govt assured to provide necessary infrastructure to the CPC Corporation which proposes investment of Rs 43,000 crore (USD 6.6 billion) in the petrochemical sector in Odisha. CPC Corporation is major petroleum and petro-chemical Company of Taiwan like Indian Oil Corporation (IOCL) and they will establish petrochemical cracker unit project in Paradip, Odisha Chief Secretary Aditya Prasad Padhi informed to news men. Patnaik said that a high-level task force headed by the Chief Secretary will be formed to provide necessary assistance for the proposed project, which will help in setting up petroleum downstream industries in Paradip. The delegation had on Wednesday visited Paradip to inspect the infrastructure facilities at the site for the proposed investment following a meeting with Union Petroleum and Natural Gas Minister Dharmendra Pradhan on Tuesday in New Delhi.